Counselors are available from 8 a.m. to 6:30 p.m. Monday through Thursday; and on Friday from 8 a.m. to 4:15 p.m. Appointments preferred, but walk-ins welcomed on a first-come, first-served basis. The Counseling/Advising Center is located in the Pierce Administration Building, Room 104. All NIACC counselors have at least a master’s degree with counseling experience. Online Screenings – for eating disorders, alcohol issues, anxiety disorders, and depression. Since the services of the Counseling Center are offered to you on a voluntary basis, you may arrange for an appointment whenever you have something you wish to discuss with a counselor. However, should you feel the need to see a counselor immediately, feel free to come to the counseling center without an appointment. Arrangements for an appointment with a counselor are made with the secretary at the center during regular office hours or by calling 641-422-4207 or 1-888-GO NIACC ext. 4207. Personal Counseling can assist you to gain a better understanding of the significance of your feelings, attitudes, aptitudes, and other personal data in order for you to have a more realistic basis upon which to make your own decisions. The ultimate goal is to help you grow in self-understanding so that you can cope better with your immediate situation and any problems that may arise. NIACC recognizes alcohol and drug abuse as a potential health, safety, and security problem. Students needing help in dealing with such problems are encouraged to seek assistance from our college professional counselors and utilize the resources made available through the campus and the community. Academic advising is a mandatory step in ensuring your college degree completion. Before registration is allowed, each student must meet with a counselor. Every effort is made to ensure the accuracy of information given in the curriculum section of the catalog, and academic advisors assist students in selecting appropriate courses for their program of study. IT IS THE RESPONSIBILITY OF THE STUDENT TO BE CERTAIN THAT THE COURSES SELECTED WILL MEET THE REQUIREMENTS FOR THE DEGREE SOUGHT. Students should correspond with the transfer college for verification of transfer credits. The following links to the regent institutions are provided for your use. For additional college websites, contact the Counseling/Advising Center at NIACC. 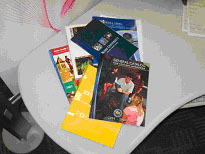 Student Support Services is a federally funded grant project which helps eligible students stay in college and graduate. The goal of SSS at NIACC is to promote academic and personal success of all participants. The Project offers counseling, tutoring, college survival skills, orientation classes, career exploration, transfer assistance, and cultural awareness. Recipients of these services must be citizens or legal residents of the United States who are currently enrolled full-time in a credit program. Participants must meet at least one of the following eligibility requirements: first generation student, low income, and/or students with a physical or learning disability. Students interested in these services should call 641-422-4105, or 1-888-GO NIACC, ext. 4105 or stop at the Student Services Office in the Administration Building. North Iowa Area Community College strives to provide an accessible environment for Students, Faculty & Staff. We provide support to students with disabilities in reaching academic goals and work to ensure equal access to educational opportunities. NIACC offers free online screenings for eating disorders, alcohol issues, anxiety disorders, and depression. The free screening is made available to all NIACC students and is taken anonymously. The screening is provided so that you may find out, in just a few minutes, whether or not professional consultation would be helpful to you. Rehabilitation services are available to eligible students attending NIACC. These may include medical and psychological assessments, vocational evaluation, counseling and guidance, assertive technology, job training, and job placement assistance. For more information, call 641-422-4227 or stop by the Administration Building room AB106.